Marsh, James H.. "Lake Superior". The Canadian Encyclopedia, 21 March 2019, Historica Canada. 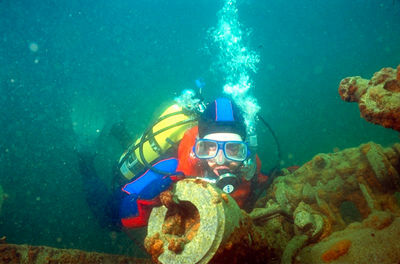 https://www.thecanadianencyclopedia.ca/en/article/lake-superior. Accessed 19 April 2019. Lake Superior is one of the largest bodies of fresh water in the world, containing more water than all the other Great Lakes combined. With an area of 82,100 km2 (of which 28,750 km2 lies in Canada), when including the American portion, Lake Superior is Canada’s largest lake. It has a shoreline of 2,938 km, with the north shore bordering on Ontario and the south shore on the states of Michigan, Wisconsin and Minnesota. 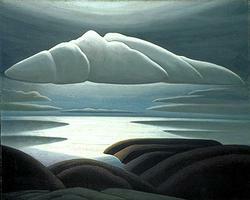 The lake is 563 km long, 257 km wide, with a mean depth of 147 m and a maximum depth of 406 m. It has an elevation of 183 m.
Lawren Harris, 1923, oil on canvas (courtesy Winnipeg Art Gallery). Lake Superior (photo by Tim Fitzharris). Some 300 rivers and streams feed the lake, including the Nipigon River (from Lake Nipigon), St Louis River, Pigeon River (forming part of the US–Canada border), Pic River, White River, Michipicoten River and Kaministiquia River. The lake discharges via the St. Mary's River into Lake Huron. Called Kitchi-gummi in Ojibwa (meaning “great lake” or “great water”), it was later named Lac Supérieur by the French (meaning “upper”) — a name that is appropriate in English as well. It garnered this name for being the most northern of the Great Lakes. The lake had its origins in the geology of the Midcontinent Rift which left a deep scar over 1,450 km long from eastern Lake Superior to southern Kansas. Massive glaciers gouged out the lavas and sandstones of the rift, but the crystalline igneous rocks were more resistant and were left to form the margins of the lake basin. When the last great glacier, the Wisconsin, began its retreat about 11,000 years ago, meltwaters filled the scoured-out core of the rift. By 6000 BCE Lake Superior was totally free of ice. The lake has two large islands: Isle Royale, which is a US national park; and Michipicoten, in Canadian waters. Less than five per cent of Lake Superior’s shoreline is developed thus, the lake has been relatively undisturbed by the pollution and degradation evident in the other Great Lakes. Fish species that spawn in near-shore and offshore waters do not appear to be affected by habitat degradation. These species include lake trout, lake herring, lake whitefish, deepwater ciscoes and round whitefish. In contrast, inshore species that have been impacted by habitat loss include brook and brown trout, walleye, lake sturgeon, yellow perch, northern pike and smallmouth bass. Because of its remote location and limited industrial activity, Lake Superior receives most of its chemical pollution via the atmosphere. As a result of climate change, summer surface water temperatures of Lake Superior have increased approximately 2.5°C since 1979, significantly in excess of what would be predicted by atmospheric warming. The lake is one of the fastest-warming lakes in the world, mainly due to its size. Due to its large surface area, the lake absorbs more of the sun’s rays than a smaller lake would. Climate warming benefits invasive species, such as sea lamprey. If the warming trend continues, potential invaders now restricted to the lower Great Lakes will quickly colonize the upper Lakes. At least 39 new non-indigenous aquatic species have already entered Lake Superior since 1970, including fish, aquatic invertebrates, fish diseases and parasites, aquatic plants or shoreline woody plants. The appearance of each new species has the potential to disrupt the lake’s ecosystem. For example, sea lampreys kill the trout indigenous to the lake, potentially upsetting the balance of species. 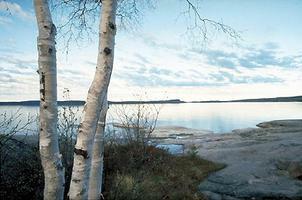 In the late 16th and early 17th century, the Ojibwa travelled west from the Gulf of the St. Lawrence to Lake Huron. Here, they moved north to Lake Superior, where they settled for some time. Étienne Brûlé was likely the first European to see the lake. Brûlé, an interpreter for Samuel de Champlain, journeyed into the area with Huron guides in 1622 or 1623. Hugues Randin was in the Sault Ste. Marie area around 1676 as an ambassador of peace to the Sioux, and Daniel Dulhut	wintered at Sault Ste. Marie, claiming these lands for France on 2 July 1679 in the village of the Nadouesioux. Various locations along the lake’s northern shore — including Grand Portage and Fort William — were key points in the fur trade for about a century. The first Locks at the Soo (to bypass the St. Mary’s Rapids) were constructed at Sault Ste. Marie in 1797 In 1783, having learned of its wealth of copper, Benjamin Franklin helped to negotiate a deal that gave Isle Royale to the United States. In 1842 the Webster-Ashburton Treaty set the international boundary through Lake Superior. After 1855, Sault Ste. Marie operated as a port for ships carrying huge quantities of grain, coal and iron ore to the lower lakes. The Canadian Pacific Railway was constructed with great difficulty through the rugged Shield country across the north shore in the 1880s, bringing settlers, logging and mining. The St. Lawrence Seaway opened in 1959, introducing salt-water shipping.